Invented during the war between England and Boers in 1899-1902, they're still used during wars and conflicts - in Chechnya, for instance. Their bulky design, however, has nothing in common with the sleek shape we see in the movie. 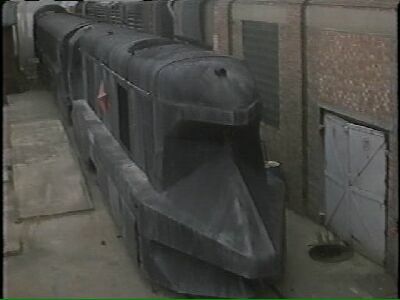 Ther are several kinds of armored trains, but nothing I could find even remotedly resembles the one featured in the movie. Those used in military operations are older and much more bulky. Those used as moving headquarters for country leaders don't look as ominous - guess leaders don't want to scare off their people. And those were used to drive around Soviet rockets probably weren't even armored - else it would be much easier to track down armored trains, they're quite a unique target.